Last year Spacehopper released their debut single 'Sounds and Colours'. It was an instant dance floor success reaching No. 1 in the Beatport Hard Dance Chart. Following the success of the single, Spacehopper performed live at festivals and clubs and have gained an ever-increasing following. They have also put on their own party events, which are incredible nights. So now here it is! 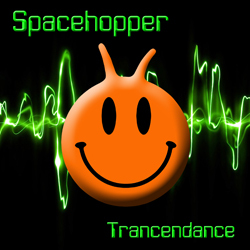 Spacehopper's follow up single, 'Trancendance'. The single features three mixes. The first mix is an uplifting trancefloor epic, the second is one of their excellent dub mixes and the close is another awesome trance mix. They were formed by Chris Spacehopper who pushes machines to extremes, using synthesisers, computers and machines to produce the core sound. Paul Spacehopper adds his rhythmic percussive skills whilst Phil Spacehopper adds some driving bass and guitar overlays. 2014 is also going to be an exciting year for Spacehopper. They will be playing at gigs, parties and festivals - with their debut album planned for release later in the year. For more info on Spacehopper check out their web site on www.spacehoppermusic.com.